Panettone cakes, those weird brioche-like cakes dotted with dried fruit, dot up everywhere over the holidays. You can buy them at grocery stores, gas stations, and pharmacies and avoid them as you might, you’ll inevitably end up with a few. While they might have been a gracious gift, their very presence in the kitchen can be overwhelming. What do you do with a weird product that, while sold as food, could double as a sponge? Apologies for the horrible photos. This panettone repurposing project was taken on in Burlington, VT while on a little trip and was executed in poor lighting, at night, and with solely an iPhone for a camera. It’s also brown…which isn’t the most photogenic color. I promise that it tastes much more wonderful than it looks! Generously butter a 9″x11″ glass baking dish. Cut Panettone into large chunks between 2″ and 2.5″ square. Arrange Panettone in the baking dish, evenly covering the bottom of the dish. Heat milk, chocolate chips, sugar, vanilla, and salt in a small saucepan over low heat. Stir constantly to prevent burning. Remove from heat when the chocolate begins to melt and continue stirring until completely melted and the mixture is smooth. Let cool. Add eggs to the melted chocolate mixture one at a time, mixing with a whisk after each addition. Pour the mixture over the bread. Press the bread down gently with your whisk or a wooden spoon to fully saturate the bread. Let sit for at least 20 minutes and up to an hour. Bake at 325F for 30-35 minutes or until the custard is set and the edges are beginning to get crisp. Let cool slightly. Serve with whipped cream or ice cream. 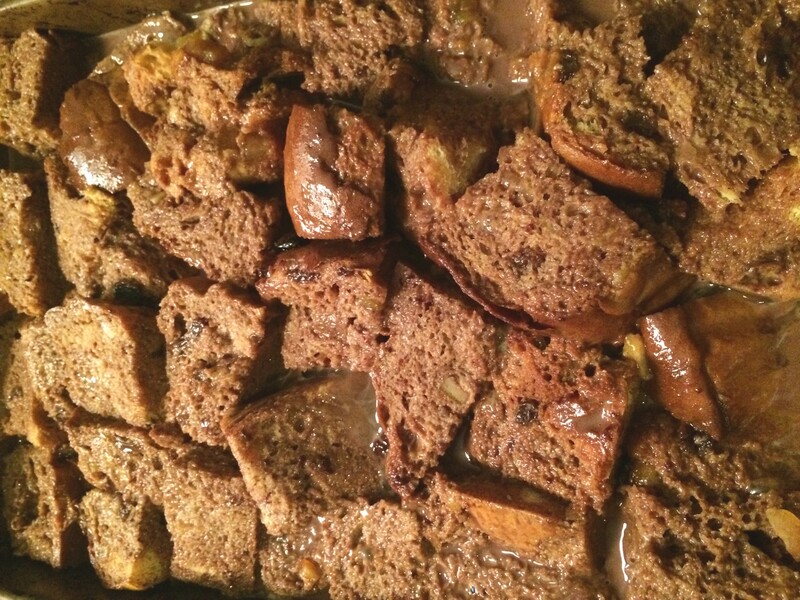 Bread pudding right before going in the oven!